Urinary system cleans the blood and rids the body of excess water and waste in the form of urine. 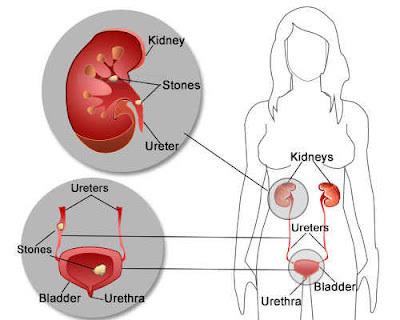 Urinary tract consists of two kidneys, two ureters (one from each kidney), the tube that urine flows from the kidneys to the bladder (storage bag), and urethra. Muscle helps control the release of urine from the bladder. The kidneys, a pair of bean-shaped organs, located at the bottom of the rib cage on the right and left rear. Although the body is equipped with two kidneys, you can function with one kidney is quite healthy if the other is damaged or removed. The kidneys receive blood from the aorta, filters it, and sends it back to the heart with the right balance of chemicals and fluids for use throughout the body. Urine was created by the kidneys will be moved out of the body through the urinary tract. The kidneys control the quantity and quality of the fluids in the body. They also produce hormones and vitamins that direct cell activity in many organs, whereas the hormone renin, for example, helps control blood pressure. When the kidneys are not working properly, waste products and fluid can build up to dangerous levels, creating a life-threatening situation. Among the important substances the kidneys help to control are sodium, potassium, chloride, bicarbonate (HCO3-), pH, calcium, phosphorus, and magnesium. In the U.S., kidney disease is the ninth leading cause of death; diabetes and hypertension are the most common cause of chronic renal failure. If you have diabetes or hypertension, you have a greater risk of kidney disease. (For links to more information, see the Related Pages, Elsewhere on the Web.) Any disease that affects the blood vessels, including diabetes, hypertension, and atherosclerosis, may interfere with the ability of the kidneys to filter blood and regulate fluids in the body. Diseases and infections in other parts of the body can also lead to kidney problems. Because life-threatening kidney damage, disorders and diseases that affect the kidneys appropriate prompt attention. Kidney disease often causes no symptoms until late in its journey and can lead to end-stage renal failure, which is fatal unless the dialysis machine is used or a kidney transplant done. There are over 100 disorders, diseases and conditions that can cause progressive damage of the kidney. Some of the more common problems described here. Warning signs that should not be overlooked are also listed. Kidney disease often take place quietly for years, with no signs or symptoms or the patient can recognize the signs are all too common for patients to suspect kidney problems. For that reason, routine blood and urine tests are very important, they detect blood or protein in the urine and normal chemical levels in the blood, such as creatinine and blood urea nitrogen (BUN), early signs of kidney problems and failures.